I'm having trouble with my car in the high RPM range. Torque falls off to nothing beyond 7K and the curve gets rough. Anyone seen a curve like this? Does detonation look like this? Is yours a 6-port engine? Are APV and VDI operating correctly? IIRC they should kick in at around 6~7k RPM range. If they are stuck closed, your car will have difficulty breathing at high RPM. Yes, 6 port. APV, VDI, and SSV are all operating correctly. I've visually confirmed VDI and SSV. Removed the actuator and held APV open and the curve looks the same. This is with a restrictor plate but it looks the same without it (just 6 hp less). Confirmed that throttle is staying open. New coils, wires, and plugs. Is there a cat and is it plugged? The jitters look like ignition trouble, but there are other causes. I know the parts are new, but possible they're faulty or poorly connected? Also, possible the dyno is incorrectly calibrated? Hp and torque don't cross at the correct rpm (using VDi/APV points as reference) but I can't see the left side of the graph, maybe torque is on a different scale. Pretty good numbers otherwise. If it kept going you'd have something. All great thoughts, thank you. I've replaced the engine harness with a new one from Mazda, Currently running BlackHalo coils but I'll try the OEM ones again. Previously I saw no difference. HP/Tq cross. Good catch. 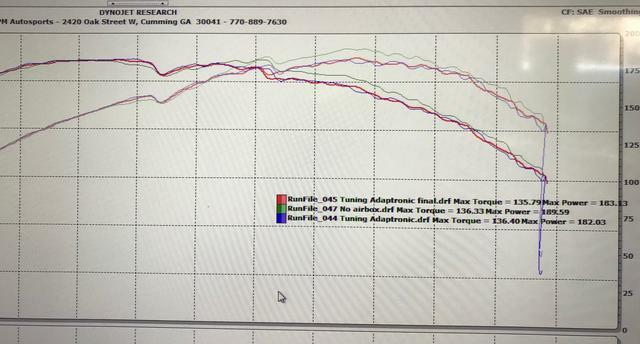 I don't know how to get the software to scale torque and HP the same, The axes are different. No Cat, BH headers and 3.5" exhaust all the way out. I put a scope in the muffler and it looks good. AF is 13.2 steady the entire pull. Seems to start to break up at secondary injector transition. Maybe a bad injector? I initially thought it was a flow issue but I think I have ruled that out. I log fuel pressure which is rock steady, as it ignition timing. I agree that ignition issue is about all I have left so I was wondering about detonation. I run 9 plugs all around but could go to something colder. Just hoping someone had seen something like this before and could give me a quick answer. Curve looks the same only less power with stock RB flashed ECU. I've seen that dyno shape many times before and it almost always ends up being ignition related . You would be shocked at how many 585 coils I've found to be faulty from new ! Wait why do you run 9 spark plugs in leading? Does it work better with stock7s? That seems like asking for trouble? Denso offers some spark plugs that are equivalent to NGK 9 in leading and NGK 10 in trailing, so 1 or 2 steps colder than stock. Those spark plugs have finer firing tips than NGK stock plugs, and some folks here do claim that they give slightly more power and fuel economy(no hard data, though). I doubt cold plugs would cause issues unless they are fouled. ^^ higher number is a hotter plug. So he's creating unnecessary detonation risk. Higher is colder for NGK and Denso spark plugs. Some other manufacturers like Champion do it the other way around. Correct. Have some 10.5's on order, along with a set of stock coils from Mazda. Thanks for the info, I'll let you know if it solves the problem. +1 I would check all the coils. You may also try a gapable plug that you can close down to 0.025" and see if the problem goes away. If it does, you can bet its a spark delivery issue. Dumb question, but is the extra ground from the BHR coil harness grounded properly? Guessing it is, but figured it can't hurt to double check. Also, if it turns out to be a problem with the BHR coils, contact Charles. I had a coil die on my set. He had me send the kit back to him. Got it back a few days later will good coils, free of charge.